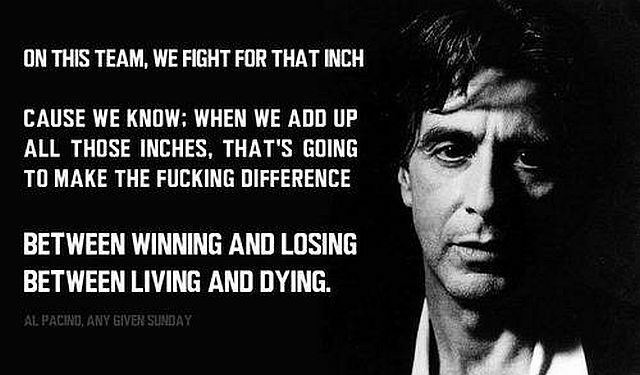 You’ve Got To Fight For Every Inch | What is the Meaning & Purpose of Life? Set-backs are a part of life — and how we respond to them ultimately determines whether we are a “success” or “failure”. The below video clip is an inspirational pre-game speech from the movie, Any Given Sunday, starring Al Pacino — it is delivered by a head football coach to his team before the biggest game of their lives, and at their darkest hour. They are about to take the field against a formidable opponent, after experiencing devastating loses from outright team dysfunction — the result of pervasive individualism and overwhelming selfishness, which he likens to being “in Hell”. In his speech, he associates life with football, which he describes as a “game of inches”, where the margin for error is so small, the “inches” can make the difference between winning or losing. So he implores them to “claw” their way back out of their Hell “one inch at a time”, and to do so AS A TEAM . . . NOT as individuals — because “when you add up all those inches”, they become”the difference between winning and losing” . . . be it a football game . . . or in the game of Life. This entry was posted in Being a Leader, Getting Inspired, Knowing Yourself, Never Giving Up, Team Building and tagged Al Pacino, Any Given Sunday, Failure, Inspiration, Introspection, Leadership, Perseverance, Self-Actualization, Spencer C. Young, Success, Teamwork. Bookmark the permalink. Pingback: EXPECT The Miracle To Come | What is the Meaning & Purpose of Life?